Learn about the science basis dedicated to information. Currently, the scientific knowledge generation basis spread by Aliança SIPA is completely based in four experiments, which embrace different production regions of the brazilian sub-tropic. These are long-term, integrated crop-livestock systems based experiments, generating reliable and safely applicable information. The experiment conduction is in charge of two of the most remarkable universities in our country, which are Federal University of Rio Grande do Sul (UFRGS) and Federal University of Paraná (UFPR). Both universities, from undergraduate, mastership and doctorate researches, have the commitment to generate information and spread it in order to complete the knowledge chain. Experiment #1 – Inserting livestock in the productive background of soybean. 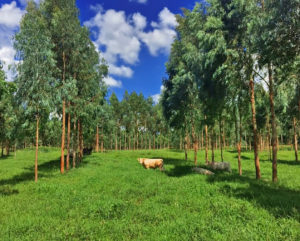 The experiment is being conducted by direct sowing since 2001 in an area belonging to Espinilho Farm (Fazenda do Espinilho), in São Miguel das Missôes. The soil is classified as clay red latosol, deep and well-drained. The systems compares the introduction of winter grazing lands in rotation with soybean crops and areas with no integration. The experiment area is around 22 hectares. The treatments consist in distinct heights of grass: 10, 20, 30 and 40 cm and a treatment without grazing. It is used male cattle, aging 12 months in contious grazing from the first-half of July extending to the first-half of November, when it makes way for soybean crop until April/May. 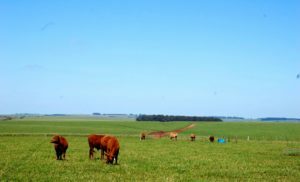 The hypothesis lies on the impact of grazing instensities in livestock production and soybean crop in sucession. Experiment #2 – Sheep farming in rotation with soybean and maize crops. The experiment is being conducted under a no-tillage system since 2003 in Experimental Agronomical Station – UFRGS (Eldorado do Sul/RS) in a sandy loam red Acrisol, with a slightly wavy relief, and a total area of 4.8 hectares. During winter, the experimental units get annual ryegrass, managed following two distinct methods: continuous or rotatinal grazing, and two grazing intensities: 2.5 and 5.0 times the comsumption potencial of lambs in confinement. The setting is made every end of rotational grazing cycle and variable stocking capacity is set according to grazing production forecast during grazing cycle. During summer, the units are split into two production systems: one holding a soybean crop monoculture and the other one holding annual soybean/maize rotation. In the year of 2017, this experiment has undergone changes and today it aims to evaluate the impact of system’s fertilization (only during winter, holding ryegrass, or during summer, holding soybean crop), on soil features and on sheep livestock and soybean production. The experiment conduction remains the same, utilizing grazing sheep in a variable stocking rate system, aiming to keep a ryegrass height of 15cm. The hypothesis of the current experiment concerns on the effect of potassium and phosphorus fertilization time on livestock and crop production, as well as on main soil features. 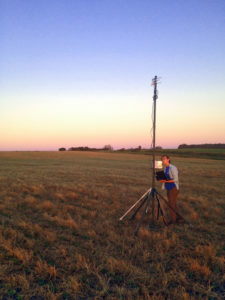 Experiment #3 – Diversifying agricultural production in lowlands. The experiment is being conducted since 2013, at Corticeiras Farm (Fazenda Corticeiras), in Cristal/RS. The area is holds a Haplic Planosol, with a plain relief and 18 hectares of no-till in 4 out of 5 systems. The studied systems represent distinct rice production scenarios in lowlands in the southern half of Rio Grande do Sul. 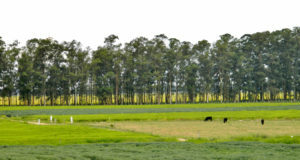 The grazing cycle uses young beef cattle in continous grazing. From winter of 2017, the systems got new adjustments, mainly envolving fertilization time. Aiming to evalute the nutrient usage efficiency on different systems, only the reference production systems, holding rice in monoculture and intense soil plowing, will get fertilization during summer, while the other systems receive fertilization during winter, caracterizing a systemic fertilization. The hypotesis concerns on the impact of introducted grazing on agricultural rotations and spatial (intensituy) and temporal (length) diversity of these rotations. Experiment #4 – Integrated crop-livestock farming systems in promotion of sustainability in Enviromental Protection Areas. The experiment is located in Canguiri Experimental Farm (Fazenda Experimental Canguiri – UFPR) in the city of Pinhais/PR, since 2012, in an Enviromental Protection Area (APA) of Iraí, a territorial unity established in 1996 for “protection and conservation of water quality and quintity for public suppliy purposes”. There are studied seven treatments, which explore different combinations of maize rotations, sunflower crops, oat + ryegrass, Áries grass and eucalyptus. The experimental area holds 32 hectares.